As most of you know, we’re in the midst of a big build here at Moregeous Mansions and have been living in two rooms, a bedroom upstairs and an office downstairs, for a little over a year. Whilst working full time, we’re doing a lot of the work ourselves so things are moving steadily but not *quite* as fast as I’d like them to. My friends used to laugh if I ever said I’d like to go camping (did they think I was high maintenance?!) but I reckon I could pretty much cope with anything having lived with no heating, hot water, bathroom or kitchen now for over a year. We can’t waste money on temporary fixes, there’s just no point, so we’re gritting our teeth and bearing it. I last did this in my twenties. It was definitely easier then. Like many home renovators / self builders, my cooking facilities have been pared back to an oven (no space for a hob) and 1m of work top in the corner of the office, which is great for heating the room, but not so great for keeping on top of mess. The fridge is in another one of the work rooms and the only water supply is upstairs, so any washing up to be created is carefully assessed and limited! One pots meals – big tick. Meals which create a huge pile of detritus – huge no-no. 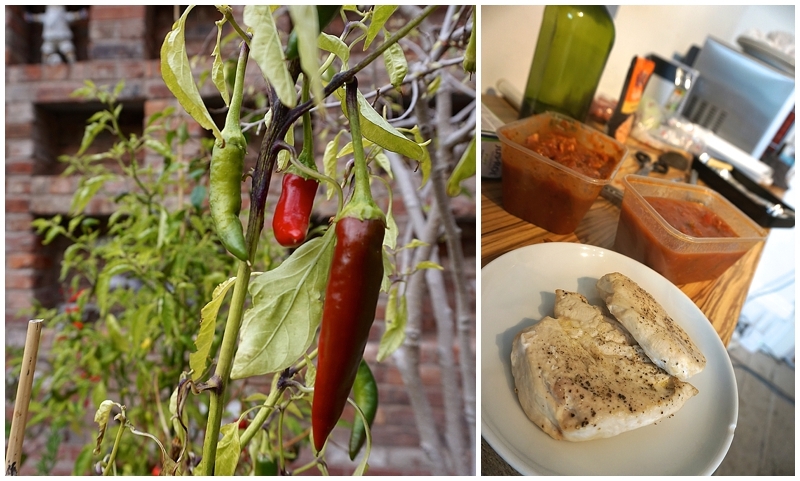 Over the last year I’ve become a bit of an expert in creating fast, filling meals which are cost effective, tasty and good for us – food fuel to keep us going in the long, dark winter time and energising summer specials in lighter months. Mr M takes a lot of feeding (as you’ll know if you’ve seen him) and I like good food. Not *clean* food, not faddy food, just good food which’ll keep me going but won’t pile on the pounds. So, if you’re stuck in a food rut whilst restoring your home, or are temporarily without a full kitchen, these Renovation Recipes are for you! One pack of ready made puff pastry (320g approx) Jus-Rol is decent. Make your own? Don’t be daft, you’ve NO KITCHEN. 300g tomato paste / sauce. I made mine by roasting down a pound of toms with some thyme, seasoning & a touch of olive oil but you can use shop bought. If shop bought, approx 2 packs Dolmio Stir-In sauce or similar. Two chilli peppers – medium heat, chopped finely. If you don’t like chilli, leave this out, but season well. Bake the two chicken breasts on foil on the above tray until just cooked through (15 mins). Remove from the oven and allow to cool. Chop into smallish chunks whilst the bacon cooks. Cook the bacon through in the hot oven, on foil on the same tray, for ten mins, remove and allow to cool. Cut with scissors into thin strips. 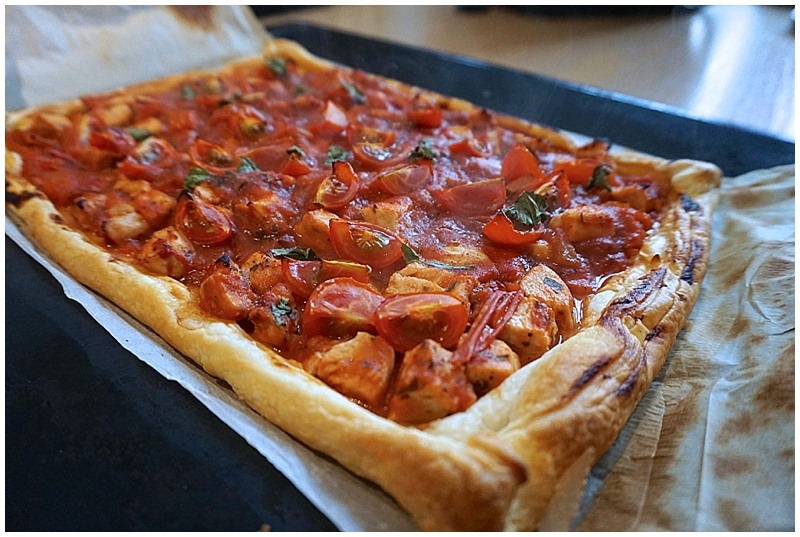 Add the cut up chicken and bacon to your tomato sauce. Allow to cool, or pop in fridge for ten mins. If the sauce is warm, it starts to melt the pastry when you spread it on, which makes the pastry soggy. Nobody likes a soggy bottom. Slice the cherry tomatoes into quarters and rip up some basil leaves. 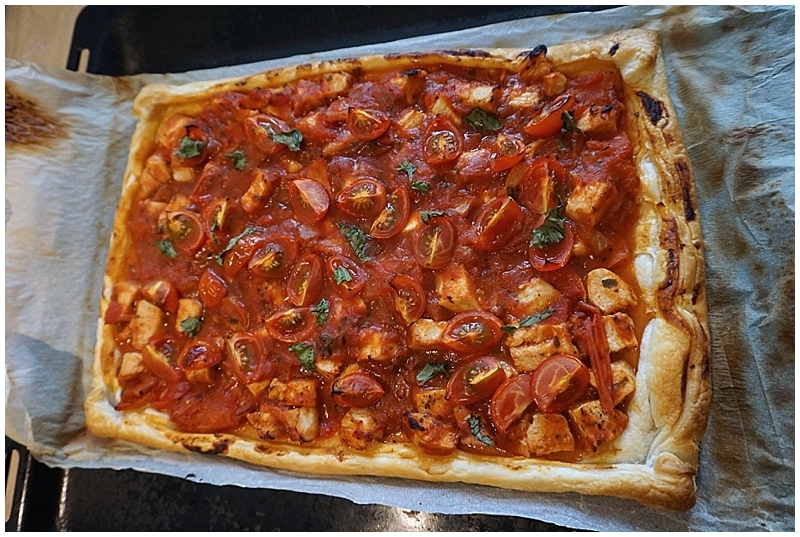 Evenly top the pastry with the chicken, bacon and tomato mix (having stirred in the chilli if you fancy it, leaving it out if not). Scatter the cherry tomato quarters evenly around on top then the basil leaves. Get the heated oven tray out of the oven, onto a heat proof surface. 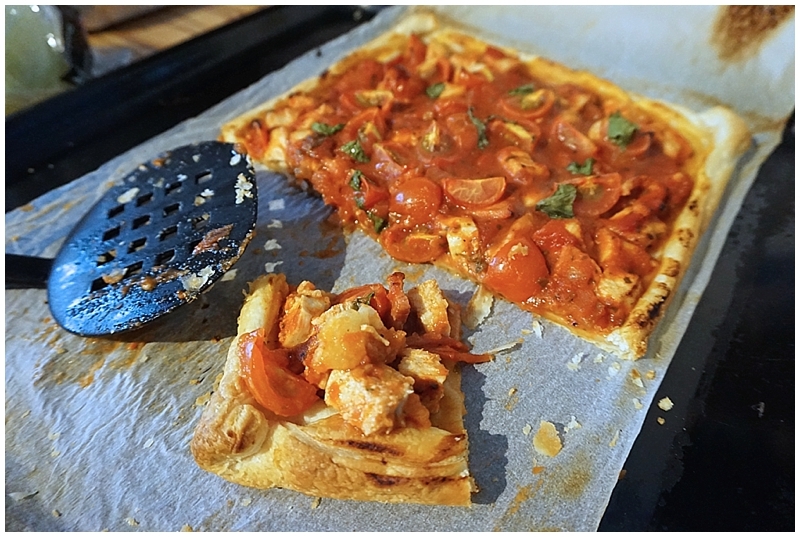 Carefully lift the whole tart, using it’s paper base, onto to the tray then pop into the pre-heated oven for 25 mins . I like my tarts at room temperature, Mr M will scoff them straight out of the oven. They’re delicious cold, having been chilled overnight but that rarely happens here as there’s never any left!! These puff pastry rolls are fantastic to keep in the fridge and give you a warm, filling meal super fast. You can pretty much throw most ingredients onto them in the same way you would a pizza, cheese, meats, veg and they taste great.